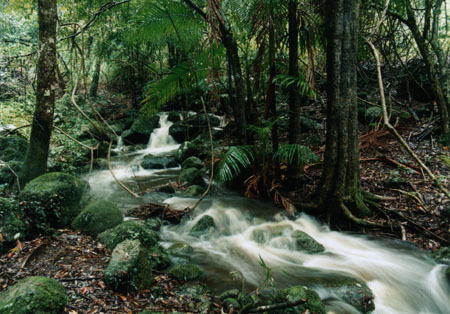 Wilsons Creek Huonbrook Landcare Group is represented by a group of landholders who have made a commitment to repairing and enhancing the natural landscape in the Wilsons Creek, Huonbrook and Wanganui valleys within the Byron Bay Hinterland of Northern New South Wales. Our valleys here contain 50% of the remaining rainforest within the Byron Shire (Byron Flora & Fauna Study 1999). The group is a not-for-profit organisation and is affiliated with Richmond Landcare Incorporated. On 8th March 2004 the Landcare group became an Incorporated Association. There are now in excess of 60 individual landholders within the valleys who are engaged in various landscape repair activities. The landcare group is able to provide a supportive environment by way of technical and scientific expertise, and also physical and financial resources. Landholders are encouraged to prepare individual project plans which are consistent with the overall landscape repair program which the group utilises in their submissions for assistance. The community is now developing an inspiring "whole of landscape" perspective and a real sense of ownership. Wilsons Creek/Huonbrook Landcare Group works on riparian restoration projects and general revegetation activities. The group has a nursery including shade houses, potting shed and growing-on and hardening area. Plants are propagated from locally collected seed for distribution to landholders. The Landcare group relies completely on volunteers for work days, community projects, administration and fundraising activities. The group hosts social functions, field days, educational sessions and workshops. A quarterly newsletter is distributed to the community (300 households). Members of the group attend training sessions and conferences, bringing new skills and information back to the group. We are continually refining our planning and improving our background information resources. A weed mapping strategy was prepared in September 2006 and is a useful tool to assist the group to determine priorities within the area. The group monitors the levels of infestation, and encourages landowners to report new outbreaks. This information is used by the group to assess priorities in determining remedial activities, and in submissions for resources from both public and private sectors. The group is undertaking a variety of research projects in association with various institutions. A preliminary survey of land snails has been undertaken with enthusiasm by Green Corps teams and landowners, and will continue in the future with assistance from the Queensland Museum. We are also involved in research projects involving Mitchells Rainforest Snail, and the rare, endangered tree Smooth Davidsonia Davidsonia johnsonii. A range of educational and reference material is distributed upon request and available from the yellow Landcare folder at Malcom's Corner shop. These include the "Fruit and Seed Collecting Guide" which lets you know what trees are fruiting and where to collect seed for propagation, and the "Planting Guide for Rainforest Reafforestation in Local Valley Environments" which lets you know what species of trees naturally occur in different areas of the valleys. These two guides are also available as downloadable files from this website. As a voluntary community organization the Wilsons Creek-Huonbrook Landcare Group makes available, on this website, information it hopes will be of interest and assistance to landcarers and others. It cannot and does not accept responsibility for the accuracy of the information herein whether that information has the character of advice, expert or other opinion, or previously published material and advises that it is the responsibility of the user to make their own decisions about the accuracy, reliability, currency and correctness of the information found.